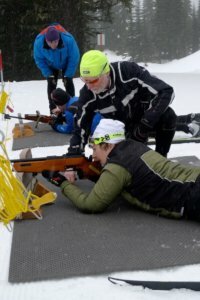 Have you ever wondered why biathlon is so popular in Europe? Why this relatively unknown sport gets so much live TV coverage in Europe? This is your chance to find out for yourself. Spend an hour learning the basics from our coaches, including learning to shoot with your skis on, and then test your skills in a ‘sprint’ race. These are small group lessons, with two students per enthusiastic coach. Not excited yet? Have a look at a pursuit or a mass start biathlon race! Register in advance as space is limited. Your fee includes ammunition, insurance, and a donation towards upgrading our shooting range. Participants must sign waivers and Biathlon BC day membership 15 minutes before session. 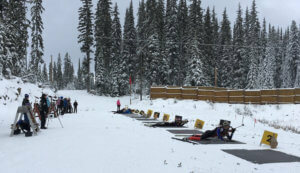 Dress warmly in layers (biathletes lie on cold mats wearing gloves not mitts, extra layers will keep your hands warm). Lesson on relevant firearm safety. Explanation/demo of the prone position, sight picture and targets, how to get down and how to get up again. 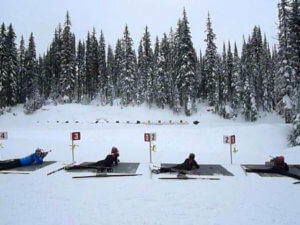 Try a short biathlon sprint race (ski, shoot large targets prone, ski, shoot small targets prone, ski and finish). One more round of shooting practice, choose between prone and standing. It is recommended that participants ski a few minutes before the session to get warm. The first round of shooting in the lesson is prone with a rifle rest.